I am charmed by how completely devastated Helga looks in the second panel here. We know that fancy sit-down restaurants exist in the Hagarverse, so I have to assume that the The Horribles attempted to go to one of those, but tragically miscalculated. Since Helga has always been depicted as the more civilized half of the pair, I assume she picked this place out, and is very sad to have to kill her own food, once again. 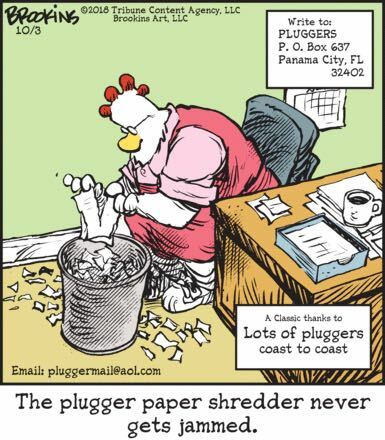 My favorite kind of Pluggers submission comes from “Lots of pluggers everywhere” or, in this case, “Lots of pluggers coast to coast,” just in case you smug elitists thought the coasts were plugger-free. (Panama City, home of the official Pluggers P.O. Box, is located in the Florida Panhandle, which is strictly speaking on a coast, for instance.) Anyway, there are lots of pluggers who think it’s hilarious that you big-city liberals are going out and spending a whole $30 on a paper shredder when you could just spend way too much time tearing up paper by hand, letting little bits get all over the rug, and eventually lose interest and do a half-assed job and not actually make it difficult for identity thieves! Ha ha, I guess pluggers have shown all of us what’s what, again!